we can help you to ensure a successful transition. According to studies, less than 25% of all business owners have a Strategic Transition Plan. This results in unmet expectations, lack of preparation, and unnecessary risk related to unexpected events. 50% of all businesses transition as a result of unexpected events, 5 D’s (death, divorce, disability, disagreement, and departure), forcing decisions to be driven by life events rather than legacy vision and goals. We partner with owners and their advisors to help define their personal, business and legacy goals and align them for peace of mind and a hopeful future. Private, mid-market business owners and family offices seeking to transition their business to the next generation, maximize their wealth, or leave a legacy. Are you currently achieving your personal, business, and legacy goals? Are you lacking a formal transition plan that outlines personal, business and legacy goals? various seasons of your life and business? at the right time, for the right reason, and with the most value? so that you can transition well and leave a legacy? 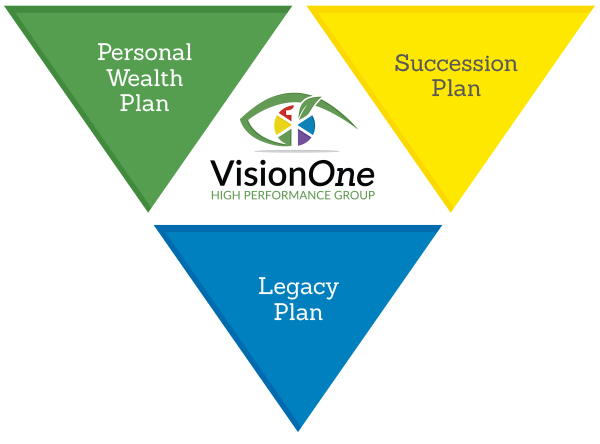 VisionOne was referred to help a multinational training company business owner and his family understand his transition goals and options. He was tired and ready to “turn in the keys” for the business, yet revenues had declined and the company was significantly under-performing, leading to unmet expectations. They asked VisionOne to help them determine their options while maximizing value, in order to transition well. Worked with owner and his wife to understand their short and long-term goals. Assessed the company’s key value drivers, leaders, and culture. Provided fractional, c-level leadership and support, allowing the owner time to be on sabbatical and identify his personal and family’s legacy goals. Evolved business model to “stop the bleeding” and position company for growth. Helped establish key relationships with key trusted advisors to ensure that personal and business goals were being collectively met. After a significant eight-year decline in revenues and profits, the company was stabilized in the first six months and moved into the growth phase. The owner was realigned into a role that supported his strengths, which fostered greater levels of leadership among his team and increased engagement. The new business model is opening up growth opportunities for the organization as they continue to dream again, radically impact the lives of their customers, and leave a legacy. buy, sell, or transfer to the next generation.